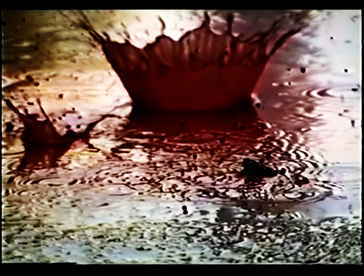 This is a film frame from Rain, the short film by Barbara Agreste. 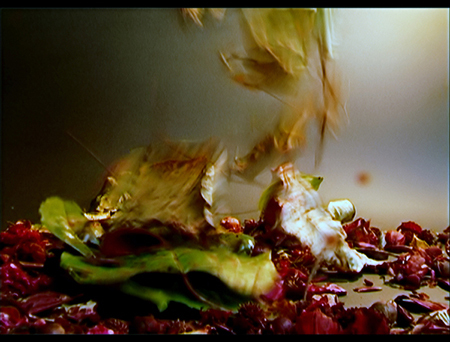 This particular frame shows the shot in which some multicolored leaves fall from the sky, and their branches are violently shaken by a mysterious and frenetic wind. This wind seems to be upset, like if it was sent from a angry God wanting to punish humans for having misbehaved, or mistreated the Earth. 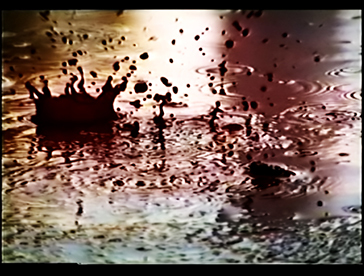 In this short film blood drips from the sky continually: it is an endless deep, thick red rain, the vegetation is flooded with it, and it is presented as almost struggling, or suffering under the heavy weight of the dense liquid. Everything here conveys the feeling of an endless crying… However there are moments of rest when the rain stops dripping for a while, and scenes of fastly moving vegetable elements are introduced: now very drammatic movements inhabit the film. The many branches from trees, and the many leaves and flowers are shaken by a devastating wind which ends up being too strong for the vegetation to hold on to its roots… This video seems to preannounce a catastrophe, or it is a metaphore for a desperate divine rage or revenge: bad weather, hurricanes, storms and strange atmospheric phenomena meet in this glimpse of time, an upheaval of nature, and a huge speachless statement of it. 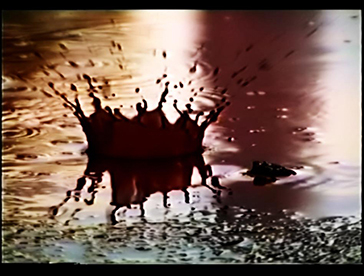 Rain Blood… Spectacular images… I wonder how this film was shot, what was used to make so thick liquid for blood, was it real blood? Excellent.